At our clinic, we use the power of Fractional laser, Fractionated Microneedling RF and mesotherapy to eliminate the appearance of stretchmark without invasive surgery. At our clinic we combine advanced skin rejuvenation lasers with Sublative & Sublime technologies for skin resurfacing, acne scars and stretch marks removal. Laser treatment and RF technology that uses radio-frequency energy (electrical as opposed to a laser, which is light energy) deliver an effective fractional and tightening treatment to reduce and remove stretchmark or acne scarring. The combo treatment is excellent for the skin of any color and discomfort is minimal. The treatment uses the combination of laser energy and radiofrequency energy to deeply heat layers of the skin while protecting the surface of the skin simultaneously. Medium to deep heating of the skin activates fibroblasts (deep skin cells) signaling new collagen to form and existing collagen to tighten, which could occur over a 1-3 months period. 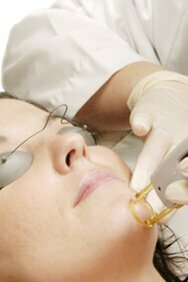 The laser deliver an effective but controlled fractional treatment. Each pulse delivers the energy via a grid of matrix spots on the surface as well as just under the surface. Fibroblasts (skin cells that produce collagen) are activated within the treated zones signal collagen to regenerate and remodel, yielding improved skin tone and texture. The surrounding tissue of the untreated areas supports and accelerate the healing process of the skin. What are the risks and side effects of stretchmark treatment? The procedure is mildly uncomfortable. Side effects are redness and swelling after the procedure that may last days, and occasionally even up to a few weeks, depending on the body parts and required energy for each treatment. When skin is stretched too rapidly, e.g. when pregnant, growth spurts, weight gain or muscle building, the subdermal collagen and elastin fiber matrix may become damaged and dehydrated leaving visible marks or scars. Elastin formation, firming the collagen matrix and rehydrating targeted areas with an undetectable molecular hydrating film. 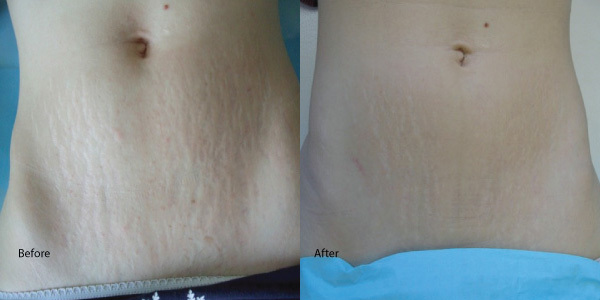 Meso for stretchmark help to rejuvenate the skin from beneath the surface. Advanced research has in fact evidence that the extraordinary properties of elasticity and tone found in elastin and collagen stem from their specific composition in certain amino acids, such as glycine, valine, proline, hydroxyproline, etc. Meso for stretchmark, by ensuring their bio-availability, optimizes the production of these fibers. Through its action on lysyl oxidase, copper enhances their networking that silicium helps to structure into a well-organized three-dimensional network. Collagen is a protein that up about 25% of the protein in the human body. Collagen is present in normal skin. As dead skin cells are sloughed off, new cells replace them. As we age, our supply of collagen is diminished or degraded. Meso for stretchmark stimulates wound healing and tissue regeneration by way of collagen matrix build-up. I highly recommend Laser Medical Clinic, amazing staff and great customer service. Terrific overall experience. Guarantee it will change your life in a positive way.